It’s because of situations like these that the Kruger National Park is the place we escape to so regularly. 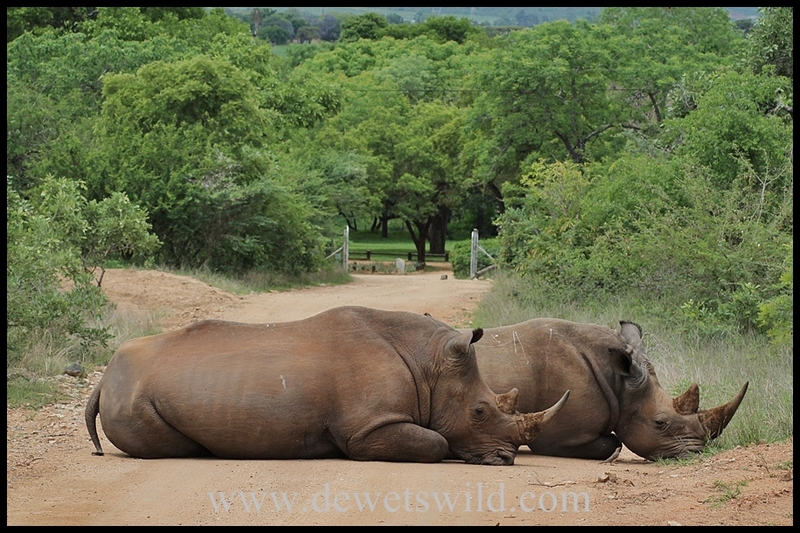 On arriving this morning, these two white rhinoceroses blocked our way into the rest camp (the gates of which you can see just behind them)! I’m participating in the LetsBeWild.com Wild Weekly Photo Challenge – this week’s challenge is Escape! This entry was posted in Kruger National Park, Mpumalanga Province and tagged Kruger National Park, nature, outdoors, travel, vacation, White rhinoceros, wildlife on October 25, 2012 by de Wets Wild. Great capture – I’m not sure that I’d want to try sneaking around those big rhinos! Thanks Adventure Nick. LOL – yes, you might just get a puncture!